A few months ago Seth Godin posted one of his typically short and to the point blog posts with the headline When should we add the marketing? Robert Bruce at Copyblogger picked up this theme in an interview with Godin where they went into even more detail on the the idea that you start with marketing concepts, it’s not something you “tack on” to a project already in process. The idea that the marketing is the first thing we do will sound unpleasant or even sacrilegious to many writers. For lots of people writing is a refuge, or the fulfillment of a vision, or a daily need, something they are “called” to do, or simply something they do because of an inner drive. What, these authors might ask, does marketing have to do with any of that? But there’s one central truth to what Godin is talking about here. This truth applies to writers who want to interest other people—people who don’t know them and who aren’t related to them—in an idea, a story, a skill, a collection of information. That truth is this: making marketing part of the beginning of the process acknowledges the importance of readers, the end users of our books. When marketing is “baked into” our books or other offerings, we’ve really thought about the readers first. Brian Clark, the founder of Copyblogger, didn’t ask his readers what products they wanted, and never ran a survey on his blog, even though it quickly grew to one of the most widely-read sites online. But he listened. Listened to his audience, read the comments, studied what people were saying. It was the market intelligence Brian gained from that listening that allowed him to launch one blockbuster product after another, building a content-driven empire. The funny thing is, as writers, we have access to one of the best sources of market intelligence ever invented, one that gives us an unfair advantage over people for whom writing is a struggle. It’s the same tool Brian Clark used to great effect. The blog. Yep, that’s our secret weapon. I talk to quite a few authors who are clients, colleagues, or readers. From those experiences, I’d say about half the nonfiction authors I’ve talked to have missed this point entirely. They don’t know who their readers are. They have no market intelligence. They don’t know the bloggers or other influencers in their niche. Consequently, they have no “listening posts” or ways to engage their audience. Painful though it may be to hear it, my advice to these authors is usually to put the book aside and spend the next 3, 6, or 12 months finding out how to answer these questions. Usually the best way to do that is with a blog. So what’s it going to be for you, if you’re a nonfiction author? Will you get obsessed with the book itself, and drive toward publication whether you understand what the market wants or not? Are you so convinced of how right your ideas and presentation are that you think people will simply accept how awesome your book is and rush to buy it? Or are you willing to step back, take the time to build a robust platform first, and thereby ensure that when you do publish that book, you have the support of a community of fans, people whose opinions, likes and dislikes really matter to you? The difference can be immense. Imagine presenting your book to a roomful of the people you know now. Once friends and family leave, you’re likely to be alone in the room. Now imagine the same scenario after you’ve grown a community, acquired readers interested in what you have to say. There will be plenty of people in that room willing to help you celebrate your publication, and help to spread it to other people too. Which one will it be for you? I think these are all good comments. As a writer of both fiction and non-fiction books I’ve got to try different marketing approaches. For fiction I find that reading group sites like goodreads.com work well for building up the idea of your knowledge in the minds of others. If you can pepper the posts with well-thought out and insightful comments, I have to believe people will take notice at some point. For non-fiction I find my own blog writing helps, especially if I’m targeting the keywords related to my books. Both require research on which sites to post to, which reader groups to join, and perhaps most especially from the post above, which book to begin thinking about next. I’m always trolling through the Amazon listings to see what’s working now for authors in certain niches. You’ll find yourself thinking of ideas for books based on a few titles you saw at the top. In response to Ed’s comment, as an aspiring fiction author who plans to self-publish a series (regency romance with a splash of epic fantasy), I believe the post’s principle still applies. A writer should THINK about marketing while developing a series and writing/editing their books, regardless of traditional or self-publishing intents. Think-Research-Listen and start making a list for your swipe pile. One of the hardest aspects of a fictional author’s platform is what do you write about that your current/future readers would be interested in (not fellow authors). For an aspiring writer with no following yet, I agree your time should be spent on writing, editing and rewriting. That said, you should still think about marketing, because at some point (say 6 months ahead of launch or yikes even at launch), you WILL market. You need to figure out topics because at a minimum you will have a website, email newsletters and one other outlet (if self-publishing, plan on more than that). 1. Where do I have a piece of my personal life in my book (a hobby, my obession for coffee, a funny experience, etc.)? Easy to embed while I’m writing and now I have several insights to share with my future readers. 2. I’ve been trolling other fictional author’s who have a rabid fan base. I’m studying the questions they love to ask their author. A common one is “what made you think of such-n-such?” As I’m doing research, I’m thinking about my future marketing – what blog topic could I share or save that photo for my (future) pinterest site (for example, an historical fashion plate for a dress I’m describing). 3. From a fantasy perspective, there are magic systems to entire new worlds to play with (huge marketing trove with very little extra preplanning). You never put all of the background in your books, but have you fleshed out the world/magic/etc enough to give away a free pdf describing it? Do you want to create and embed a special holiday into your world/book that becomes a fun marketing event in the future? 4. Deleted scenes. Now you don’t have to kill your darlings. No need to fight with the editor (they’re probably right anyways), because you have newsletter fodder with a value-added enticement to sign-up on your email list. 5. If you are lucky enough to have a fan base already, then by all means market AS you write by involving them in your WIP (run contests to name the pet, ask them to choose which ballgown the heroine should wear, what should be on the menu that your protag despises but has to eat anyway, etc). Someday I hope to be there! So yes, I believe marketing should be on your mind during initial (but especially subsequent) drafts. If you don’t have fans yet, then stockpile. If you do, then engage them with your drafts. Myka, thanks for diving into your swipe file to offer up these excellent and on-topic tips. Of course, the other reason to start thinking about marketing way before you publish your fiction is networking. When you start thinking about launching your book and letting as many people as possible know about it, you’ll pretty quickly come up with readers sites, review sites, and other venues where you can promote your book. If you plan on doing a blog tour or guest posts within your launch, it will be much easier if you already have relationships within your genre, category, or niche. Those are good points and it sounds as if you understand your niche. I was making a more generic comment here. My first novel related to boats and boating. Long before I wrote it, I was writing a monthly column of humor for a boating magazine. I even published the best columns as a book, so it isn’t that those things are foreign to me. It is more that I don’t see that as being part of a marketing plan. To me, that is simply living as a freelance writer. I have made my living writing and editing for many years, and I still shudder at the pronouncements I hear about what fiction writers (in particular, most makes sense for nonfiction) should do. For fiction there is far less “should” involved in my opinion. Inside of genres you can appeal to the mores of a fan base. Yes, your alternative world would be of interest. What in the world are you going to do if you write mainstream fiction, however? When I look at the fan base for mystery writers, I don’t see much in the way of “how did you think of that?” curiosity. And, to address Michael’s point, I don’t have any idea in the world how a writer would benefit from thinking about how his or her book would compete with Milan Kundera, or Hemingway or Salman Rushdie. Sure, you will compete with them, but focusing on that issue BEFORE you write the book is a real cart before the horse proposition. I would recommend writing the book and then seeing how it stacks up. I have friends in PR and marketing who invest hours in promoting their books (mostly about marketing and PR) and not achieving the success I would consider reasonable. I know of fiction writers who don’t even blog who sell well. I believe fiction is an entirely different animal. That doesn’t mean you can’t sell fiction, but it suggests to me that fiction should be written and then marketed. No, don’t avoid thinking about marketing ideas. Jot them down if they come up. But writers should write. 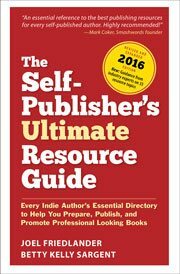 I know my question is a little bit off topic to this post, but it’s still about self-publishing and I can’t seem to find a solid answer anywhere! Anyways, I was hoping perhaps someone can help me out here. I was wondering if all the fonts that come with microsoft word are good for commercial usage (ie. using them in my book) or do I have to obtain licensing? Athena, you can freely use the fonts that came with Microsoft Word, you don’t have to obtain any additional licensing, they were licensed to you when you bought the software. Writing is an art but authoring is a BUSINESS. Some very basic questions an author should deal with before writing a book are (a) who will read your book?, and (b) how will you let potential readers know it exists and convince them to read it? There may be millions of potential readers for a new book — or three potential readers. Can your $15.95 or $24.95 book compete with 99-cent books — and free books? If you are writing your first book, how will you compete with winners of Pulitzers and Nobels? Most books have lots of competition. The world probably doesn’t need another post-apocalypse teenage vampire novel, barbecue cookbook, stop-smoking inspirational guide or JFK biography. As with so many of these posts I read, “for nonfiction writers….” and then no mention of how any of this makes sense for fiction writers. Yes, you can connect with people before you write a book, but not in a context that markets the book–only one that markets the writer. That isn’t promoting a story or an idea, but a personality. While there is nothing wrong with that, it is a quite different skill set from writing fiction. To my ear (perhaps I am tone deaf) it is like telling a doctor that before he or she hangs out the shingle, before starting medical school, they should research what sort of diseases people are contracting. While finding out that people do in fact need doctors might be useful, the rest is absurd. So if you want to write mystery stories, trying to build readership before you have even written the book strikes me as absurd. A writer might not even know much about what the story will be until they have written it. Many writers work organically. That isn’t good or bad, but if you do, there is nothing to market before the book is written other than yet another wannabe. Or am I missing something? Television producers do pilots to test the waters, not market the idea that they want to make a television show. That’s a good point, there is a difference in approach, intent, and platform when it comes to writing fiction and non-fiction. However, I think the biggest difference is not so much that you don’t have a product to sell yet, but the type of reputation and relationships you need to develop before going to market as a fiction writer. I think there is a lot of value in networking with your niche audience and getting your name out there in advance. For many writers that means delivering short stories, contributing to other projects/works, and building a bit of a public profile before launching a major book. Getting to know the lay of the land when it comes to your marketing partners, blogs, media outlets and the like beforehand can also pay dividends too. Just getting some familiarity with the personalities that are going to help you promote your book, even if it’s just through social media, can take the edge off your marketing push too. You may even make some friends in the process, which is a major plus. If you are a horror writer, is it not better to be known as the person with all of the really cool short horror stories that is putting out a book, or the unknown author who comes out of nowhere? If you know what I mean? Ed, you are quite correct that this general approach is mostly useful for nonfiction authors. As a fiction author, you have basically your shorter work or previous books to help you market to your readers, along with all the different ways fiction authors have found to get their books in front of as many readers as possible. I think you’re absolutely right, that for a fiction writer trying to build a readership before anything is written is probably not the best way for most people to go. Ideally, you want your platform to attract an audience because of the stories you write above all else. That being said, I think the concepts Joel mentions are still still valid for fiction writers. The trick is having something worth sharing and discussing on your blog. Maybe that’s a book already in bookstores, but it can also be a story available online for free. Nevertheless, your best marketing will always come from the writing itself. People who like your work will help find others that will also like your work. That’s what Seth Godin’s “When should we add the marketing?” riff means in this context. I agree with the importance of marketing books. A blog as a way of marketing a book may work great for certain writers. I am always looking for the easy way out, however. The problem with a blog is that it takes a lot of effort and time to develop. You are growing your marketing base one person at at time, one day at at ime. Key to using this approach is finding a corporation that already serves your market and has hundreds of thousands or millions of potential clients to whom you can market your book. You have to show the corporation how it can benefit from marketing your book for you (i.e. Coolness, Profits, etc. for the corporation). Then you can utilize the corporation’s blog, newsletter, or website to market your book in ways that you could not with your own blog with only a fraction of the potential clients. In fact, just pointing this out here has got my mind working on how I can utilize all the things I learned in Brendon’s seminar. Now if I can only follow all the required protocol, I will get much further than utilizinge a blog. For example, Brendon got $520,000 in sponsorships for his second book before he even started writing the book. These are the types of results that excite me. That certainly would be a fantastic outcome, Ernie, and I’m betting you can find a company that wants to partner with you based on the subject matter of your books and your long track record of proven sales. Thanks for the input.